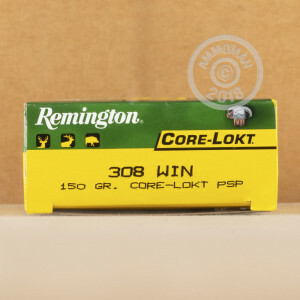 This 308 Win cartridge by Remington has both the accuracy and the devastating terminal performance you need to emerge from the woods with a trophy, because its projectile is a 150 grain Core-Lokt pointed soft point. The PSP is a naturally aerodynamic bullet given its narrow meplat, and the Core-Lokt’s spire point profile lessens the drag it encounters in flight to measurably heighten its ballistic coefficient. The Core-Lokt’s soft core is exposed where it makes its point, which in conjunction with its specially engineered jacket allows it to widen up to double its original diameter as it plows through hide and muscle. Best of all, the integral recessed band girdling the Core-Lokt’s jacket and core secures the two firmly together, so the bullet loses relatively little of its weight as it penetrates. 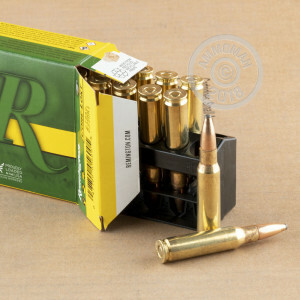 Such superior weight retention is just the ticket for deep penetration, so one well-placed shot ought to be all you need to drop even the hardiest of bucks. 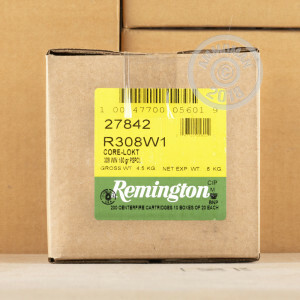 Remington’s other fine components live up to the Core-Lokt’s reputation -- with a case of these rounds at your side, your living room wall won’t have room for all the mounts you could make. Order now and we’ll send them to you with complimentary shipping!